We see similar patterns with respect to Jewish children, and a similar underlying logic of a two-way process at work. We divide our respondents into those raising non-Jewish children, those with no children at home, and those raising children they report as Jewish but not by religion, and those raising Jewish-by-religion children.22 The differences in Jewish identity indicators are very sizable at each increment (Table 9). sometimes dramatically – on measures of Jewish engagement than those with non-Jewish children at home. Consider, for example, seeing being Jewish as very important (39 percent for the no-children group, vs. 4 percent for the parents of non-Jewish children). Other indicators with sharp contrasts include fasting on Yom Kippur (47 vs. 9 percent), belonging to a synagogue (25 vs. 0 percent), and feeling very attached to Israel (25 vs. 5 percent). The bottom line: Childless adults are far more active in Jewish life than those raising their children as non-Jews. The data also strongly illuminate numerous and profound differences between parents raising children Jewish but not by religion and those raising children Jewish-by-religion. 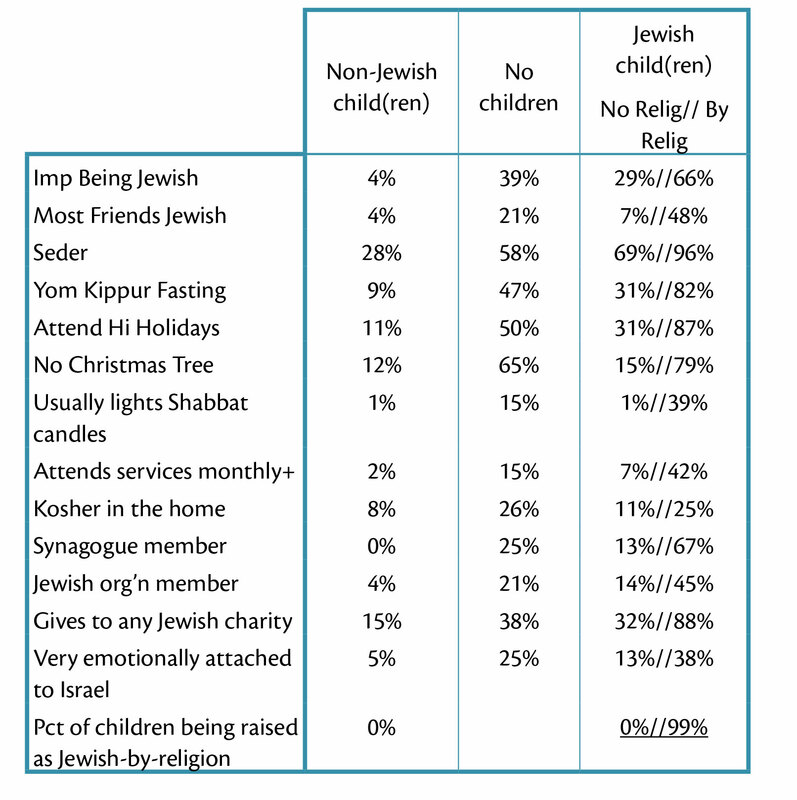 As Table 9 illustrates, parents raising Jewish-by-religion children are more than twice as likely to feel the importance of being Jewish (66 vs. 29 percent), to feel very emotionally attached to Israel (38 vs. 13 percent), to belong to any type of Jewish organization (45 vs. 14 percent), or to attend services on the High Holidays (82 vs. 31 percent). Table 9 shows that 85 percent of those raising children Jewish not by religion sometimes have a Christmas tree in their homes. In contrast, fewer than 10 percent of families with two Jewish spouses who are raising Jewish-by-religion children have Christmas trees. And as for having mostly Jewish friends – a key marker of group cohesiveness – we find far more among Jews raising Jewish-by-religion children than among those raising children as Jewish with no religion (48 vs. 7 percent ).